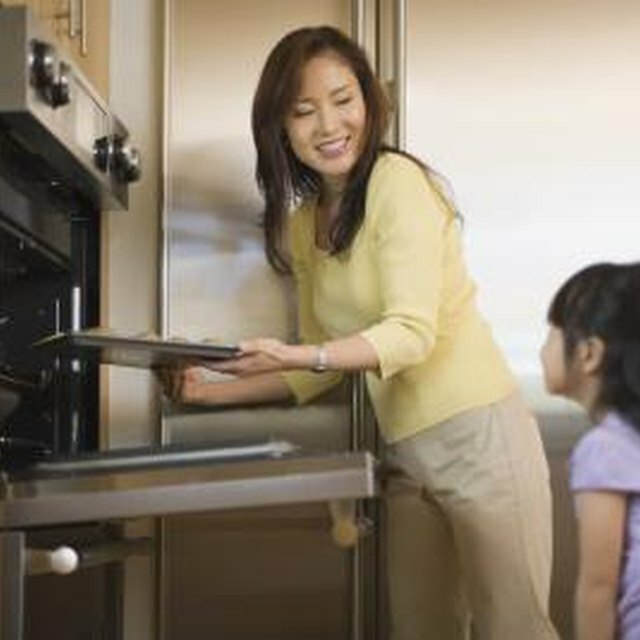 Bosch dishwashers use an electric heating element connected to the interior base of the appliance for maintaining hot water temperature and accelerating the drying time when the power dry cycle is selected. Like heating elements in ovens, the wire coil in the Bosch element may eventually wear out. Heating elements can only be replaced; there is no repair for a defective element. Changing out the part typically takes no more than an hour using basic tools. Buy a replacement element from Bosch or an appliance store. Cut the power to the Bosch, either by unplugging the electric cord where it connects to the under-counter socket or switching off the circuit breaker. Unscrew and remove the screws on the edges of the Bosch kickplate. Pull off the kickplate to locate the two points where the heating element terminals extend through the bottom of the appliance on the right-hand side near the front. Unplug the wire on the tip of each terminal. The wires have metal clips that slide off the element terminals. Remember which wire is connected to its corresponding terminal so you can reconnect them later. Unscrew and remove the nuts and washers holding the element terminals to the underside of the Bosch, using the adjustable wrench. Save these parts. Open the Bosch door to slide out and remove the bottom rack. Remove the old element by pulling upward at the two connection points through the bottom interior of the Bosch. Insert the two terminals on the new part through the two holes in the bottom of the Bosch and slide the watertight covers on the element over the mounting holes. Fasten the washers and nuts to the element posts underneath the Bosch, tightening each with the adjustable wrench. Slip the clip on each wire onto its corresponding terminal. Attach the kickplate with hardware removed in Step 2. Plug in the Bosch power cord or switch on the breaker.